I hope everyone had wonderful shoe-ventures last week! This weeks topic is shoe care - how to prolong the life of your shoes and prevent catastrophes (or shoetastrophes, hehe). Some of the following questions are from my original post introducing this blog series. One occurred to me while shooting the photos for this post. Caring for your shoes should be a top priority for every shoe lover! Taking care of your shoes means that they will be with you longer - which means that you spend less money down the road trying to replace them. Why fork over your hard-earned money if the shoe is not going to last? My shoe collection is my art collection. I wear them like shoes but treat them like precious art. 1) I need to protect my shoes from water and dirt. No way am I wearing them outside or at the club where they will probably get dirty! All you do is spray the shoe about 6 inches away, let dry overnight (or for at least 2 hours) and your shoes become water resistant! 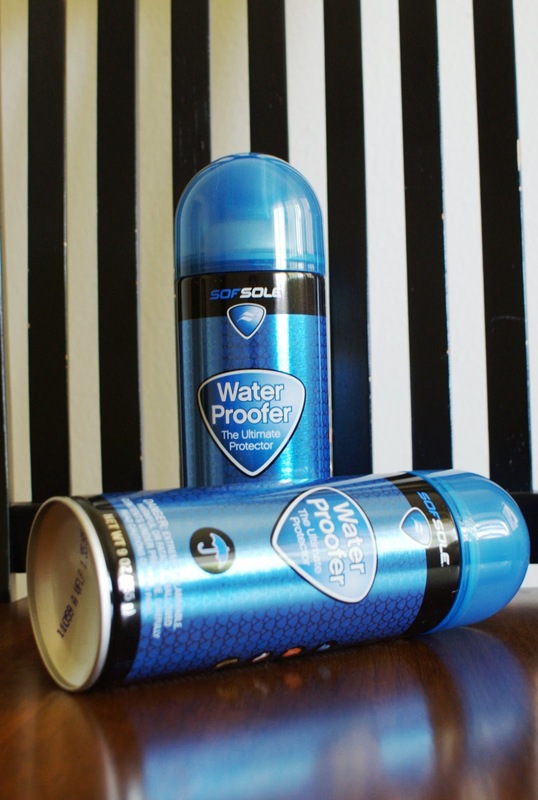 (I know, I know the bottle says, 'water proofer' but I only trust it to be water resistant. I haven't been brave enough to completely submerge a shoe in water yet.) 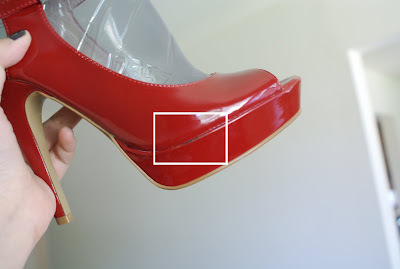 Water repellent spray should not be used on patent shoes. It can be used on all leathers, man-made materials, fabric, and suede. Just remember to follow the directions carefully (i.e. don't over-spray), otherwise you can end up having to professionally clean your shoes. It doesn't change the color or the texture of my shoes. The DSW water repellent spray also works wonderfully on purses, jackets, and other things that you need to protect. Payless sells a water repellent spray that I also really like but it comes in a 4 ounce bottle and costs the same at the one from DSW. If you have shoes that you actually want to water proof, I recommend the Nikwax line of shoe care products. For my leather boots that I know I will be using in non-friendly shoe weather, I use the Nikwax aqueous wax water repellent polish . If you have a pair of suede shoes, I recommend using Nikwax water proofer for nubuck and suede . This is the water proofer I use on my Emu boots . I redo the water proofing once a year right before winter starts. The Nikwax water proofing products are wonderful! But, in my opinion, tricky to use. You basically use the sponge applicator to rub it into your shoe and then let dry overnight. I say that it's tricky because the solution disappears almost immediately, making it a bit difficult to remember where you already applied it. 2) My shoes have been sitting around, unappreciated, in my closet for years and now they are stiff and crinkly. 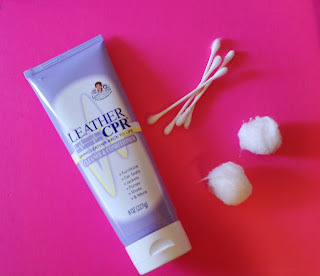 If the shoes are made of leather, I recommend using Leather CPR (see my post here), or some other leather conditioner to recondition the leather. I also recommend it for synthetic leather. Leather CPR is not oil based so it's safe to use on real and fake leather. DO NOT use Leather CPR on suede (real or fake)! I learned this the hard way. 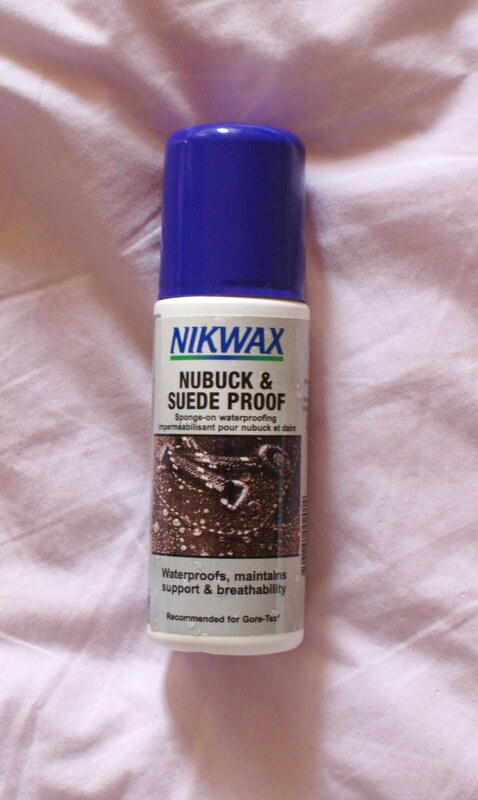 (That's what I get for not carefully reading the label...) For suede, I recommend the Nikwax suede cleaner , which is what I use to clean my Emu boots before water-proofing them. It is a sponge, so all you do is wipe it on the shoe. I only used this on leather boots because I find that the applicator discharges too much oil for my pumps. 3) My patent shoes are scuffed! It looks like they got into a fight with other shoes. If your patent shoes are scuffed, don't be sad! 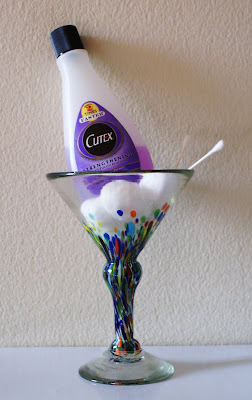 I've got a surefire way to get rid of the scuff marks! 4) My sparkly shoes leave a trail of glitter behind me, people are going to start mistaking me for some kind of fairy. Like the nail polish remover, the solution to this problem is something you most likely already own. Hair spray is wonderful at setting glitter. I recommend using a strong hold hairspray to spray your glitter shoes, but really any hair spray would work. Not only is this a solution for glitter shoes, it also works for all other glitterize items. I have also used hair spray to set the glitter on my mardi gras mask. I sprayed it 2 years ago, and the glitter still stays in place! If you're wondering, yes, that is the hair spray from the movie Hairspray. I won it along with pre-showing movie tickets. Ta-dah! You now have more of my Shoe Doctor secrets. If you have any shoe concerns you would like me to address, please feel free to ask! The Shoe Doctor is always in! If you missed out on part 1 of my shoe fitting and shoe care remedies blog series, check it out here. 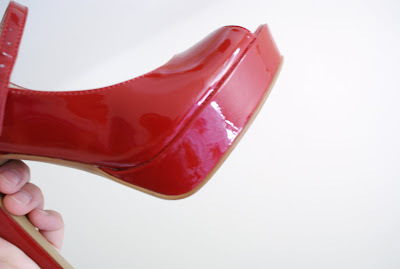 I divulged secrets on how to make your heels more comfortable.